About Knox's and Knox Spice Co.
To provide the highest quality seasonings that capture regional and world flavors and to preserve the recipes to the highest standards, with the finest ingredients, as they should be. Knox's have been known throughout history to be a bit adventurous. Originating in Scotland about 1240. The Knox surname is traced back to one Adam son of Uchtred who was granted the lands of Knock by Walter the Steward during the reign of King Alexander the II (1214 - 1249). Adam was of the same stock as the Earl of Lennox and bearers of the surname Knox are considered a branch of the Clan MacFarlane of Loch Lamond. John Knox (1513 - 1572), pictured at left, is accredited with being the creator of Protestant Scotland. Originally ordained Catholic in the 1536, John converted to Protestantism after meeting two Catholic bible thumpers in Scotland, where he was born. Their names where Wisehart and Beacon. Wisehart was burned at the stake in 1547. Being burned at the stake was a wake up call for John so he took refuge in St. Andrews castle with a group of Protestants. John eventually converted to Protestantism. Eventually the French raided St. Andrews and arrested John. He spent 19 months as a galley slave while in the company of the French and evidently did not shave. Upon re-gaining his freedom John felt the need to labor as a preacher and reformer. He was very much involved in the reform of the National Church of England. William and Mary Cambell Knox hit American soil sometime in the 1740's and gave birth to General Henry Knox (right) in 1750. Henry served with General Washington, advising the crossing of the Delaware on Christmas night and attacking Trenton (maybe you saw the painting). Henry became lifetime friends with Washington as well as being the first Secretary of War during the Washington presidency. In 1806, while visiting a friend in Union, Maine, he swallowed a chicken bone which punctured his intestine. He died of an infection (peritonitis) three days later on October 25, 1806 and was buried in Thomaston, Maine. Go figure. Seems like Henry Knox enjoyed the culinary arts as he was a portly dude. Bryan and Tim Knox, founders of Knox's Spice Co. were raised around central Kentucky and Virginia. BBQ and pig roasts are a right of passage for the Knox's and yes they use both tomato based and vinegar based sauces, depending on the mood. 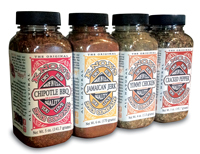 The Knox family is no stranger to making dry rubs, seasonings and spice blends and using them on just about everything. Tim and Bryan would pass recipes back and forth but when the availability of high quality and unique ingredients became possible over the internet, their passion turned into rivalry. A peaceful rivalry and one that included lots of food from bbq to just about any regional or ethnic flavor profile. Some good, some bad, some pretty, some not so pretty but all a real good time. They both had a passion and both enjoyed the art of flavor and both thought they were better at it than the other. Eventually it was decided to put their heads together. 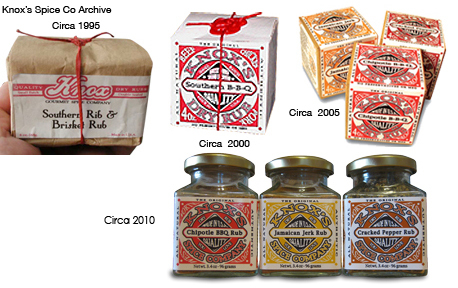 Instead of competing, they would make one excellent recipe, and in 2005 this is how Knox's Spice Company began. At launch Bryan & Tim Knox had 3 recipes, a rib and bbq dry rub seasoning, a steak dry rub seasoning and a tropical jerk seasoning. 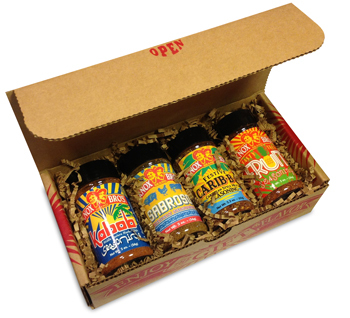 All 3 of these core seasonings are still available as Chipotle BBQ, Cracked Pepper and Jamaican Jerk. All still made of quality ingredients with low salt contents. Soon after, they released what they had been eating for over a year, Yummy Chicken. A family (and retail) favorite and now considered one of the core Knox's Spice Co seasonings. 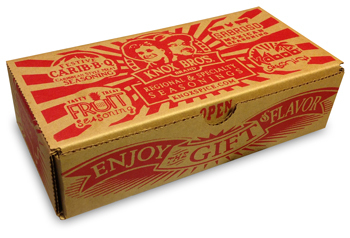 Early in 2009 the Knox brothers set out to create salt free dry rub seasonings. The principle concept was to create a seasoning without salt so people could control the amount of salt. Two flavor profiles were created; Barabicu (Caribbean style) and Sabroso (Mexican style). Both were discontinued in 2012 as it seems nobody really gives a darn about salt free BBQ dry rubs. Sadly in January of 2010 Tim Knox passed away at age 39 from pulmonary fibrosis. His drive and incredible ability to make people think, and be happy about it is greatly missed. There are no words that can say how we feel about Tim's passing but will say it was a great privilege to have known him and we will proceed just as he would have wanted. In 2011 after much struggling with Tim's passing it was decided to launch a new brand in honor of all the unfinished projects, Knox Bro's. Brand. Released in 2012, the new label features rendering of Tim and Bryan Knox. The first product in the Knox Bro's. 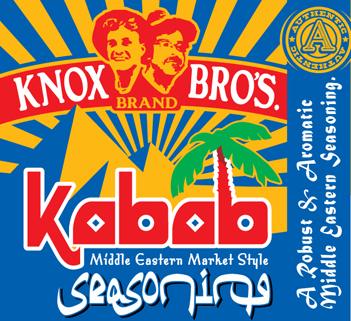 line is a middle eastern market style kabob seasoning simply called Kabob. In 2013 Knox Bro's introduced their Tasty Treat Fruit Seasoning, a dessert seasoning for sweet fruit, based on seasonings used by Spanish street vendors. Shortly there after a recreation of the Sabroso Mexican style seasoning recipe was released as Sabroso (again) but not a salt free seasoning. Knox Bro's. Sabroso Mexican Style Seasoning is a full flavored seasoning for chicken and pork and proven to be very tasty with beef and goat as well. The most recent addition to the line is our Knox Bro's. Carib-b-q Caribbean style seasoning for what ever requires that Island flavor. There is a list of flavor profiles, regional and specialty seasonings yet to be finished. We work on making them as great as they should be, keeping the faith and honoring a brother who had to leave before his time. We think he would be proud. New for 2013 - The Knox Bro's. Brand Gift Box. We decided to commemorate Tim Knox with a gift box. We wanted to write a song but our talents do not include writing music. We felt since he was our gift there would be no better way to remember him. The gift box is designed by Bryan Knox and hand silk screened. The seasonings are regional specialty blends and include the Knox Bro's. Kabob middle eastern market style seasoning, Sabroso Mexican style seasoning, Carib-b-q Caribbean style seasoning and Tasty Treat Fruit seasoning for seasoning and decoration fruit. Each seasoning comes from traditional roots and blended with the finest ingredients for the best flavor. Tim would be proud. November of 2014 we moved into the Shenandoah Valley in Virginia. We have been working on moving into Virginia for several years and finally jumped on it. The Knox's have a fairly long history in Virginia and the east coast. Family stretching from Franklin County, Roanoke, Botetourt County up into Augusta County and down into North Carolina. We are happy to be here and working hard to get set up and begin creating new seasonings and barbecue gifts baskets while having incredible mountain views and being able to visit family. Illinois was fun but a slower pace called as time passed. We switched from our paper based packaging to glass in order to keep our seasonings fresh longer and to maintain our responsibility to recyclable and reusable containers. As of 2013 we have switched our packaging yet again to American made food grade plastic. This was done to support the American work force and reduce product damage as well as shipping costs. Retailers were excited as the new jars take up less shelf space and are larger with no added cost. Everybody wins. Knox's Chipotle BBQ seasoning is rich with intense flavor. Smoky, spicy and slightly sweet. We use Chipotle and Guajillo peppers from Mexico and smoked Paprika from Spain. The Jamaican Jerk seasoning is created with fragrant Jamaican Allspice, Thyme, Ginger and other Island flavors. The aroma and flavor will send your taste buds on an Island adventure. Quality black pepper from Indonesia is blended with aromatic herbs and gourmet sea salt to make Knox's Cracked Pepper dry rub seasoning. Created from a traditional Brazilian BBQ recipe (Churrasco). Balanced to enhance the naturally succulent flavor of beef. This superior blend can also be used as a condiment for cooking vegetables or as a seasoning for sauces, soups or salads. "We love and use our dry rubs ourselves. We do not make a novelty product and wanted to make sure it says gourmet quality from the label right to the center of our products. We make our dry rub spice blends without fillers or additives, just like real dry rub should be." Dry rubs are spice blends used to season food, especially BBQ. As the name implies they are rubbed, usually into meat. This infuses rich flavor directly so you do not need to worry about re-applying. It does not burn off like a sauce. Dry rubbing is the best way to directly infuse flavor into meat. Our blends compliment the naturally succulent flavor of pork, chicken, beef, fish, shrimp and game. Aromatic and flavorful, they will bring out the best of your grilling experience. You can add citrus juice such as orange and lime to make excellent wet rubs and marinades or as a condiment for vegetables, soups and sauces. BBQ rub is the second most important part of the BBQ process, the smoking technique being the first. Knox's Chipotle BBQ dry rub has a bit of the smoky built in as Chipotle peppers are smoked. We also use the finest smoked Spanish paprika available. We use a flake gourmet sea salt but not as a filler. The amount of salt is enough to constrict the capillaries in the meat, making it succulent, but not enough to make it salty. Apply 3 hours before grilling or smoking, to maximize the flavor. Remember to refrigerate as to not let your meat spoil. Sprinkle over the entire surface of the meat and with your hands rub or massage in to surface. Use a generous amount at first and then, as it starts to get moist and adhere, add more. Wrap the meat loosely in butcher paper and leave in the fridge until a couple of hours before smoking or begin directly after. Like any marinade you would make, there is liquid, usually something bitter like vinegar or citrus and oil, preferably olive oil. To this you can add herbs and spices. Below is a basic marinade. Knox's quality gourmet rubs have been created to fill the void of novelty rubs and spice blends. BBQ rub historically was used to flavor and preserve meat. With refrigeration widely available, all the salt traditionally used is not as necessary. We use salt but not as a main ingredient. Most commercial rubs still use a lot of salt mainly because it is cheap and they can use it as a filler. We use salt to tenderize and enhance flavor, but our blend is made mainly from the rich traditional herbs and spices to create a rich flavor that has made dry rubs famous with people who love to grill and cook meat. Ours, especially Chipotle BBQ is a spice blend that can be used to spice up many other foods such as mashed potatoes or popcorn. Dry rubs are the most efficient method of imparting seasonings onto a meat. As the name implies, rubbed into the surface of the meat. When using on poultry make sure that you also season the cavity of the bird. It can also be added under the skin. Dry rub used under the skin of the bird will impart flavor directly to the meat, not only the skin. We have three flavors of BBQ dry rubs for different tastes.